The contribution of Information and Communication Technology (ICT) can leverage the exercise of democracy effectively. GOVERNALIA “Citizen Participation” is a participatory tool to foster collaboration and active participation of citizens in decision-making on the municipal or regional management. The proposed solution aims to be an innovative contribution in the attempt to reconcile the voting system with a process of collective deliberation, in order to guarantee the right of the individual to participate and intervene in the management and decision-making in the locally, this being one of the fundamental rights of citizens, constituting an inseparable part of democratic society. GOVERNALIA Participatory Budgeting allows citizens to propose and decide on part of municipal resources. The solution allows for greater transparency and efficiency in municipal management by sharing rulers and ruled where the taxes are going to be spend; allows a rapprochement between administration and citizens and creates spaces for dialogue between politicians, neighbors, communities and technical personnel. Its main objective: the direct participation of citizens in the budgeting process, being able to track the commitments made. GOVERNALIA Where does my money go? It is an interactive solution to visualize how budgets are distributed, showing in a graphical and intuitive way where revenues come from and what the spending is. Not only it aims to open a window of governance, but to show the reality of income and expenditure, both Budget Planning and Execution, so that anyone can understand the information published. GOVERNALIA Where does my money go? is a tool intuitive enough to be understood by people with no previous experience, but at the same time shows the reality of a Municipal or Regional budget as a whole, covering both the revenue and the expenditure sides, allowing to people interested in knowing more, dive into the details of each budget item. Possibility, through connectors “web-services” to integrate alternative existing applications (economic, financial…) in the muncipality or autonomous region for reading and synchronizing information in real time, avoiding the intermediate step of temporary files. Despite the many existing tools in the market, very few solve effectively the coordination between different agendas of a working team. Governalia Integrated Appointments is an Internet innovative solution and shared calendars that speeds and simplifies the process of requesting an appointment, improving citizens attention and avoiding unnecessary waiting times. 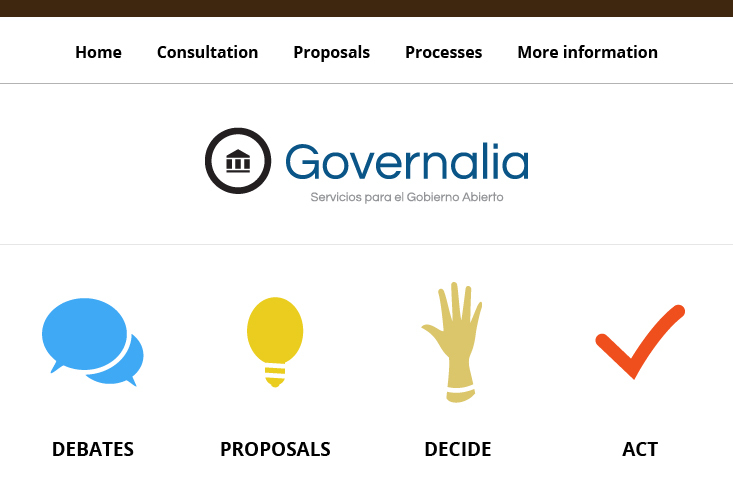 Governalia Integrated Appointments allows citizens to schedule appointments with municipal technical services for personal ised attention, advice and undertaking of different formalities in just 3 clicks, immediately and from any device with Internet access. Similarly, allows the booking of different municipal services such as sports facilities and event rooms, facilitating efficient management of public resources, avoiding queues and unnecessary waiting. Be easier and reach more people: services reach EVERYBODY and EVERYBODY can take part in them. Be innovatice: to the current range of services, a wide spectrum on interactive services are added encouraging citizens participation. General information of interest to Citizens: resource guide, programs, facilities, people … through customizable forms with direct links to communicate with officials and municipal technicians. eGovernment services: In addition, and in order to enhance the efforts made by the modernization of the administration to e-Government, the platform will be ready to apply in future development phases, capabilities and accesibility technical aids, transferring their benefits of ease of use and impact to the electronic environment between Local Administration and Citizens.